The Copperplate instructions by George Bickham are for writing the script with a square cut quill using the edges for the fine lines. However, all the examples of his writing are from engravings which show letter forms that cannot be produced with an edged nib. While I don't doubt the validity of his instructions, the engraving and printing process clearly changed the writing enough that the original instructions did not apply. Edited by Columba Livia, 13 November 2012 - 17:49. I'm not too sure about the thorough debunking of there being no transformation. The John Ayre quote merely states that a written copy can be as correct as an engraved copy. Just to be clear, I never stated that the originals were not written with quills. 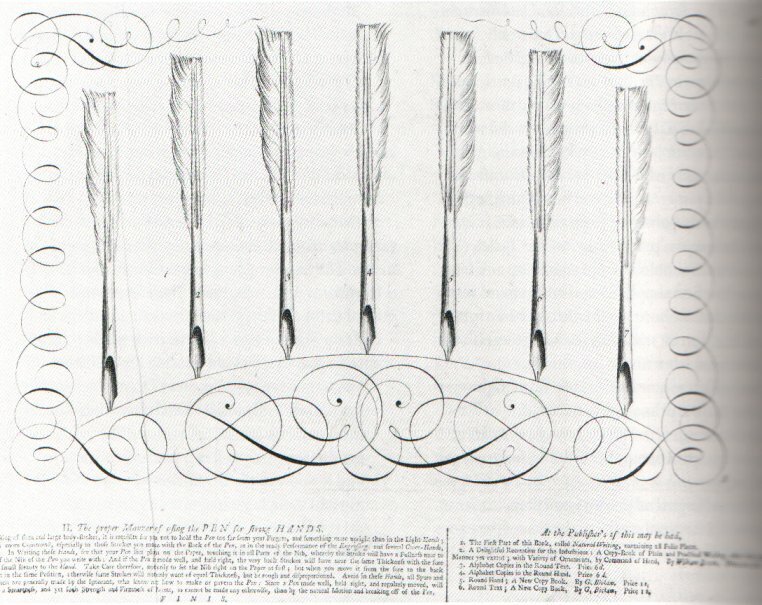 It seems to me that the printed copies we see today are nearly impossible to replicate with square cut quills. 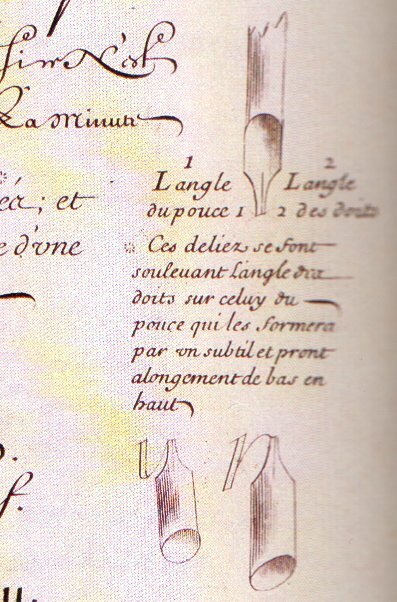 Bickham's instructions call for no change in angle of the quill and to use the edge of the nib for the thin lines. I just don't see how that can be done with any degree of efficiency to produce what we see as the printed version. This leads me to believe that some 'tranformation' must have taken place during the transfer from paper to plate. This is merely my opinion based on my own observations. I believe that this analysis is correct. In an attempt to emulate the engraved lettering, the use of a flexible nib was adopted. Content removed at author's request. Edited by smk, 26 November 2012 - 22:11.
replicate with square cut quills. This sort of writing is, as should be obvious, what eventually evolved into English Roundhand; the sort of writing you see engraved in the universal penman et al. 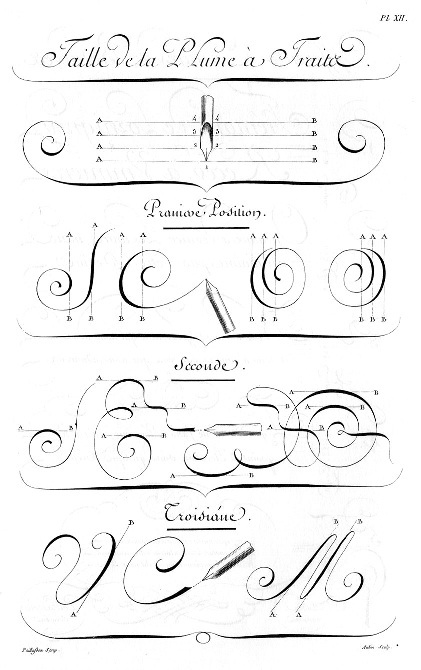 Those scans above are from Claude Mediavilla's book Histoire de la calligraphie Francais and they are no outliers or exceptions to the rule of fine penmanship which was reproduced by engravers as the many examples in that book show. This comes right back to what the engraver said: "Many who are ignorent concieve mighty things of Engraven copybooks and that no written copy can ever be so correct as that which is engraven". And it is obvious that by "correct" he means accurate or alike. In an attempt to emulate the engraved lettering, the use of a flexible nib was adopted. Not only has it not been "debunked" - it's no myth. Do you have any specific criticisms to make of what is written in "The Copperplate Myth" or is that a contradiction alone? The only purpose of describing Edward Johnson as an "amateur" in this context, can only be to denigrate him. Fortunately, Johnson's place in history as an innovator / teacher / calligrapher is secure. The only purpose of claiming that the calligraphers of the 17th and 18th centuries were unable to write what they had engraved (or engraved themselves) is to denigrate them, their skills and their art by making it a production of the engraver and them into cheats and liars who peddled work that was impossible to actually write. Fortunately, their place in history as innovators, teachers and calligraphers is secure. When viewed in the proper historical context, it is obvious that Johnston was an amateur. I refer you to This article which is an examination of the popularity of ilumination, illuminated adresses et al from 1848 and up till WW1. Johnston's manual was one of many and it is quite clear from the evidence there that these manuals and these were books aimed at a petty-bourgeois audience for leisure activities. It is hard to discern exactly what wider influence Edward Johnston has had outside of a narrow and exclusionary strand of calligraphy which is riddled with false narratives and myths intended to make him look more important than he was and to exclude and denigrate calligraphy which attracted the ire of Johnston and his students (which seems to be pretty much everything after the invention of the printing press). Typical examples of these myths and false narratives include the claims that no one could teach him calligraphy when he went to London, that everyone had forgotten about the broad edged pen, that no one knew how medieval scribes wrote, that there was a great decline in the quality of calligraphy and handwriting till Edward Johnston came along etc etc. Such myths and legends are the province of amateurism. Not really sure how he innovated either given that what he "rediscovered" was already known. It will never cease to amaze me how people can claim with a straight face that he rediscovered the broad edged nib or whatever and trust books and sources which make such claims. It'd be like me going around saying I rediscovered the chair. Edited by Columba Livia, 19 November 2012 - 13:33. 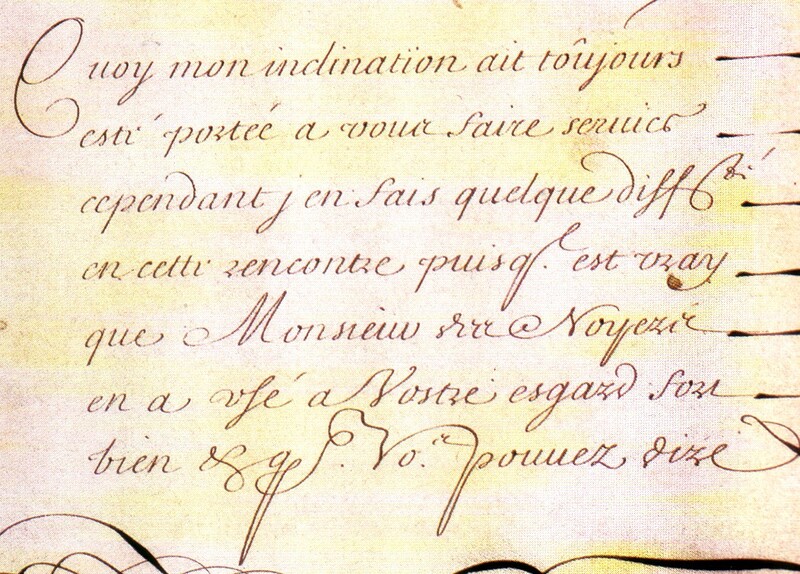 Whilst there is no doubt that the calligraphers represented in "The Universal Penman" wrote with edged nibs and created the hairlines with the corner of the nib, this is the first time I've seen the demonstration by Jean-Baptise Alais De Beaulieu (1680) which gives absolute confirmation of the technique. Thank you for posting this. However, your examples of pre-engraved writing, are fairly uneven in execution. As no examples of the originals of the writing engraved in Bickham's book still exist, it's reasonable to assume that, similarly, don't always achieve the flawless perfection of Bickham's engravings. It's impossible to determine the degree to which the engraved versions are 'improvements' over the originals - but I do believe that there are differences, even if they are only in degrees of consistency. If there are no significant differences between the original writings and the engravings, why was it considered necessary to adopt the flexible pointed nib to emulate the printed English Roundhand? I know that George Bickham in "Penmanship Made Easy" refers to the edged nib only, but eventually the flexible nib replaced the edged nib for this type of writing. It is reasonable to assume that this was because it was too difficult, and in some cases probably impossible, to emulate the engraved examples with an edged nib. Certainly, the flexible, pointed nib is much more difficult to control than the edged nib, so there must have been a good reason for its adoption. You may not believe it, but I'm not an unquestioning advocate of all that Edward Johnson said and stood for, but I do believe that there are significant differences in our viewpoints of the gentleman, to make further discussion pointless and I feel that we should just agree to disagree on his merits or otherwise! Columba Livia, thank you for yet another illuminating post. The scans you have included would help me in illustrating my position. From the example of Louis Barbedor's Calligraphy you provided I can spot three things that are different from the letter forms in The Universal Penman. 1. The shades on the left side come down to and cross the baseline until the stroke rises above into a hairline. In TUP, the examples show a bottom heavy shade on the left side but it narrows down to a hairline _before_ reaching the baseline. 2. The first stroke of the letter 'n' is what you would expect from an edged nib, the examples in TUP start with a curve. Another related difference is the connector to the letter 'n' from a previous letter. 3. The slant in the example written with a quill is slightly less than the examples in TUP. I do not believe that Copperplate writing was introduced by the engravers of the time. I do believe that the originals were written with a quill. However, my own observations support the possibility of some subtle changes being introduced during the engraving process. Enough that replicating the engraved reproductions with a quill became nearly impossible. I would appreciate it if you could point me to the source of these example. I tried searching on the www.paris-bibliotheques.org site but kept getting stumped by Google translate. I would love to learn to execute Copperplate with an edged nib. You may find this link of interest. Originally published as "Ecritures," Encyclopédie ou Dictionnaire raisonné des sciences, des arts et des métiers, vol. 2 (plates) (Paris, 1763). This is also a great resource from Alais de Beaulieu 1680. Edited by WestLothian, 22 November 2012 - 23:02. There is sufficient evidence to prove that the assertion that Edward Johnson re-discovered the technique of edged-nibbed writing is mistaken. However, there are examples of Victorian lettering where the letters have been written/drawn in outline and then painstakingly filled in to emulate edged-nib writing - so in some quarters, at least, the technique had been forgotten. Edited by caliken, 23 November 2012 - 21:54. Edited by smk, 26 November 2012 - 22:08. Wonderful enlightenment as always, Ken! The scans you have included would help me in illustrating my position. I'm not really sure about that. Remember that the right-oblique cut was taught in France and left-oblique or straight in England. I know that George Bickham in "Penmanship Made Easy" refers to the edged nib only, but eventually the flexible nib replaced the edged nib for this type of writing. It is reasonable to assume that this was because it was too difficult, and in some cases probably impossible, to emulate the engraved examples with an edged nib. Certainly, the flexible, pointed nib is much more difficult to control than the edged nib, so there must have been a good reason for its adoption. Ink does not flow from the edge of broad(edge)-pointed steel pens very well. The ragged hairlines and flow problems that result from using a broad-pointed steel pen for English roundhand mean that if you are going to use a steel pen, a pointed one is far superior and luckily English roundhand can be written very nicely with a pointed steel pen. However, you could write with a broad edged steel pen if you really wanted to. This writing is all enlarged except the small good pigeons. 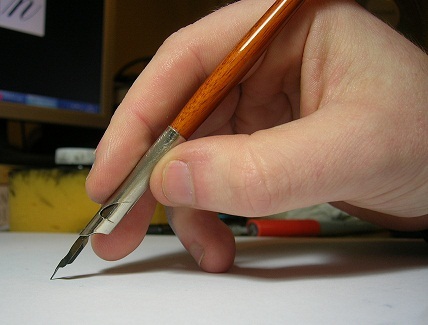 I did not alter the position of my hand when I wrote with it, I only moved my fingers and thumb back and forth which quite naturally results in the edge of the nib being used for most upstrokes (thus the hairlines). WRT to pointed pens being harder to control than edged ones, I think a lot of it depends on the hand hold. My anecdotal experience is that the way most people end up holding their pens today means that they would find pointed pens harder to use than edged ones because they'll have their hand on its side with the pen pointing off to their left. These were indeed very interesting - thank you for posting these. I am wading through the translated descriptions of the techniques at the moment but find it hard going. The letter forms in the exemplars are just slightly different than English Roundhand but they get me one step closer. You are right. The examples of French writing are what I get with a right oblique nib. Strangely I get closer to the English Roundhand with a right-oblique than with a straight or left-oblique nib. I must confess I'm stumped by this. I get what Ken showed in his comparison when I try to replicate Copperplate with a left-oblique nib. The left-oblique puts the weight of the shade on the lower left and upper right sides of the round shapes for me - I cannot get what you have demonstrated with the left-oblique, or even straight, nib. Would it be possible for you to capture a video of the writing technique? I am really interested in learning how to do this. Columba Livia has produced Copperplate with an edged nib in the 'Help in finding a pen' thread which leads me to believe there is more to it than I originally believed. Have you seen that? I have an unfair advantage with familiarity with the modern language, however the "s" used for plurals (final letters) looks a bit like "cc" and there is the occasional long s that looks like a looped "f". It is remarkable when working through the book to think that it was written 100 years before the French revolution. The front piece says written at the author's home in Paris, on the corner of Harley lane, with the official privilege of the King. "The pen with two beaks serves greatly to render the general effects. It's why I advise the curious reader to use one for these particular exercises..." There is a diagram on page 55 with the thumb and fingers cuts to show how two obliques can be introduced to such a pen. Showing how subtle angle changes and elongations can produce and shape fine liaisons and hairlines. I note that none of the "n" hairlines are to the Copperplate style. I'm limited by what I can glean from the diagrams - which is quite helpful too. We should continue this discussion in the thread: Copperplate Handwriting & English Roundhand since we have long gone past what this thread was intended for. I believe there is much that will be useful to others and it will be easier to find in that thread. I will move the last few posts in this thread to the one mentioned above unless anyone has strong objections to it. Just a question, what angle do you hold the pen at? I guess you do some hairlines with the corners of the pen: I can imagine how to do it with a dip pen or a quill, but, is this possible with a fountain pen? why can't i view the examples?